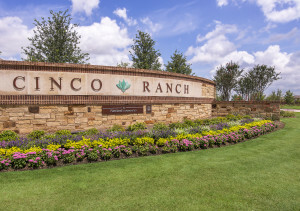 Located along FM 1488 in Montgomery County, Cimarron Creek is a 117-acre community that is poised to capitalize on the impressive growth taking place near The Woodlands, Texas. The community will include 310 homes on the site of two old homesteads, and will feature mature trees, an open meadow, designated wetlands, and a natural creek. Developer and homebuilder KB Home is committed to preserving as much of the existing vegetation as possible – clearing only areas that were designated for roadways, lots, and storm water detention. 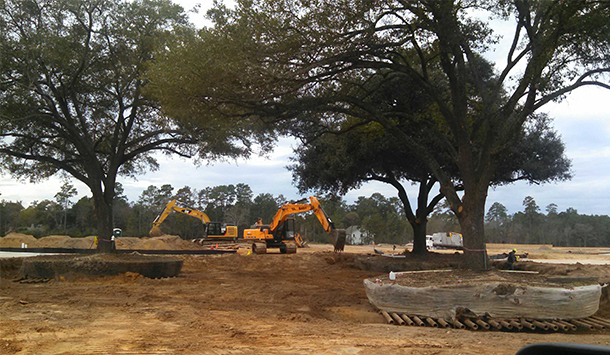 RVi worked with KB Home and the tree transplant experts at Environmental Design Inc. to relocate three 50-60 year old live oaks on the site. These three iconic trees now act as a focal point in their new home at the central node of the development. KB Home has also dedicated a portion of the site for a tree farm to be used by Trees for Houston. You can watch a video of the tree relocation here. “We are proud of the work that is being done to preserve and restore the trees and other natural land features on site at Cimarron Creek. This is our largest community focusing on preservation and restoration in the Houston area, and we believe the upfront effort will be well worth it for future residents to enjoy living in this beautiful natural setting,” said Mary Julia, Land Development Manager for KB Home. 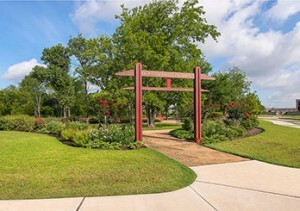 A ¼ mile entry boulevard will serve as a wooded gateway, providing residents a scenic sense of arrival on their way home. Cimarron Creek will also feature a recreation center with a pool, playground, and picnic pavilion that caters to all ages and acts as a gathering space for individual, family, and community events. A trail system will link residents to the recreation center and to a large open lawn designed for unstructured entertainment. Cimarron Creek is currently under construction and is set to be complete in the summer of 2016. “Trees Take Center Stage at Cimarron Creek” – as they should! Looks like a beautiful project!